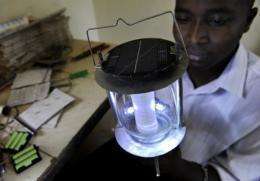 Evans Wadongo holds up one of his solar-powered LED lamps at his workshop in a Nairobi suburb. Not yet 25, Evans has already changed the lives of tens of thousands of his fellow Kenyans living in poor rural communities by supplying them with some 15,000 lamps since producing the first one from pieces of fabricated scrap metal and discarded solar equipment in 2004. Evans Wadongo is not yet 25 but has already changed the lives of tens of thousands of his fellow Kenyans living in poor rural communities by supplying them with solar lamps. As a child growing up in west Kenya, Wadongo struggled to do his homework by kerosene lamp. He was caned at school if his family ran out of fuel for the lamp, and he permanently damaged his eyesight by sitting over the smoky fumes when they did have kerosene. But his father, whom he describes as a teacher who was "very strict" and "my greatest inspiration", saw that he completed his studies and made it into university. Once there, Wadongo started wondering how to improve conditions for children in communities similar to his home village -- and there are many. Though Kenya is one of the richest countries in east Africa, more than half the population lives on less than a dollar a day. The young man had always wanted to help people but did not have the stomach to go into medicine, so he opted for engineering. He was only 19 when he invented his first solar lamp after using part of his student loan to buy what he needed. "Then, I never thought it would take off on this scale. I just wanted to take one to my grandma," he recalled. Some 15,000 lamps have been turned out since production started in 2004, and Wadongo says his goal is to hit 100,000 by 2015. "I started in the village where I grew up and I saw kids going from primary into high school," he told AFP. He has no time for Kenya's political class, accusing them of "wanting people to remain poor so that they can stay in power". For Wadongo, the lamps are not an end in themselves, but rather "a way to lift people out of poverty." Jeniffer David, 47, hangs her solar-lamp outside her mud-brick house to get some sunlight at Chumbi village, some 50 kilometres southeast of Nairobi. David says the lamp has changed her family's life. Now, her children can read and study in the evening, without cost or nuisance. He and his team from the "Use Solar, Save Lives" project start by identifying impoverished communities that rely for lighting on kerosene lamps -- when they can afford the fuel. They hand out 30 lamps to a community association, often a women's group, and encourage the locality to pool the money each family has saved by no longer buying kerosene. When the fund accumulates the group can use it for a project, such as fish farming or rabbit breeding. Nomadic communities get a special model of lamp for easier transport. Typical is Chumbi village, some 50 kilometres (31 miles) outside Nairobi where Wadongo gets an enthusiastic welcome. "They all want lamps," smiles Agnes Muthengi, a representative from a local association, the Kalima Kathei Women's Fellowship, who accompanied him to the village. Jennifer David, 47, lives in a mud-brick house flanked by outbuildings made largely from scrap metal. Next door, a field of maize wilts for lack of water. David's husband is a casual day labourer and work is hard to come by. Her only other source of income is a fledgling rabbit breeding business. But with one rabbit only fetching the equivalent of one euro ($1.3) locally and one of the five children sick and in a home, life is a struggle. A slogan painted on rusted corrugated iron informs the visitor that the inhabitants "trust in Jesus". Hanging on a post in the yard, one of Wadongo's lamps is charging. 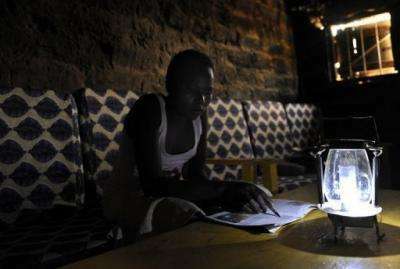 A villager at Chumbi village, some 50 kilometres southeast of Nairobi, reads with the aid of a solar-powered lamp in her house. 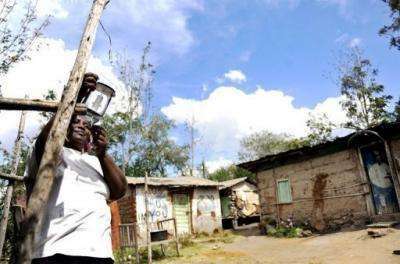 She is among the villagers in the east African country who have benfited from solar-powered LED lamps innovated by Kenyan Evans Wadongo. "Since I got this lamp things have changed," David told AFP. "Before I was using kerosene. It smelled and gave off a lot of smoke and I was using a lot of money to buy the kerosene." Now, her children can read and study in the evening, without cost or nuisance. Wadongo plans to extend his project to neighbouring countries -- Uganda is next on the list. He is already training interns, not only from Kenya and elsewhere in Africa but also from US universities. He also aims to decentralise production of the lamps, thus providing work for unemployed youths. The young engineer is also planning a "model" village at Nyaobe in the west of this country, which straddles the equator. Residents will be hooked up to a local solar-powered grid and will have access to Internet. "If every one of us started thinking about others before thinking about ourselves the world would be better," he says. this is a better way to help the people of africa than western governments giving money to often corrupt regeimes. The pushing of this "appropriate technology" by Agence France Presse and Phyorg.com is racist WWF crap. Franklin Roosevelt successfully implemented rural electrification 70 years ago in the United States!! The whole premise that Africa has a different culture than the west and we can't impose our values on them, is nothing more than a thinly disguised ruse for international finance to continue extracting resources cheaply from that continent unimpeded , i.e. loot them. The gullible mis-educated liberal that swallows this and similar propagandistic tripe is culpable in what is tantamount to deliberate genocide because they put the blinders of denial whenever they are confronted with the glaring light of truth. This application of solar power should show the way to other applications. Electrification of villages can occur with a village or tribal based solar panel system.It is the research being done in the EU, China, US,Brazil,and India which will lead to the creation of a simple cheap solar panels.The larger problem for villagers is clean water and how to recycle the water they do have for themselves and their animals.Experiments in Arizona have led to much better systems.The conflicts in Africa remain too wedded to the violent past of the tribal entities. Drawing a map does not unite people,nor does it provide the social support system needed.Those who assume this is a racial problem ignore the Chinese,Japanese,Koreans, and other Asian nations which have overcome years of fragmentation to pull together.